... list is hardly exhaustive, of course. For instance, it is unimaginable that we'll go 10 full years without a White House Conference on the Coarsening of Culture, that some form of deadly yet cuddly mammal will be identified as near extinction even as its population is increasing, that we will suddenly recognize that our core common culture is threatened by the failure to teach "The Brady Bunch" in the K-12 curriculum, and that viruses are either multiplying or disappearing altogether at an alarming rate. The important thing is that such outsize and overblown fears distract us from what really matters. Which may not be such a bad thing, especially if we suffer another decade like this last one. Embrace the decade's new distractions and overblown fears. Nick Gillespie on what will be the Y2K, bird flu and corrupting rock lyrics of the 2010s. 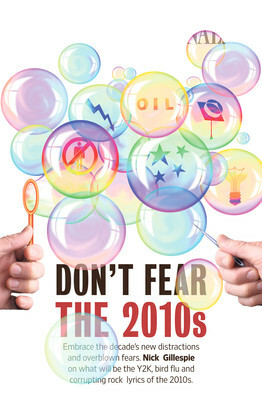 WSJ-Few decades have been as resolutely and relentlessly dismal as this past one, which is thankfully all over but the shouting (a note to calendaric purists who insist that the decade really runs from 2001 to 2010: You're part of the problem). Contested elections, international terrorism, more bubbles blown (and burst!) than on a Lawrence Welk special. Did we really survive the Y2K bug, avian flu and the unstoppable proliferation of saggy pants for this? There was plenty serious that went wrong with "the Aughts" (one more indicator of a desultory decade: the period has produced no commonly shared nickname). It was one of the worst decades ever for stocks, the U.S. mired itself in two seemingly endless and intractable wars, total federal spending increased by more than 100% in real dollars, unemployment hit double digits and for the second time in 10 years, the government is poised to massively intervene in health care (and not just Medicare this time). Most troubling for long-term economic growth, and hence living standards, it is no longer clear where the public sector ends and the private sector begins. It's hard to escape the sinking feeling that the government-controlled General Motors may well be prototyping America's answer to the Lada. and ...who exactly is going to pay for Baby Boomers' entitlements.